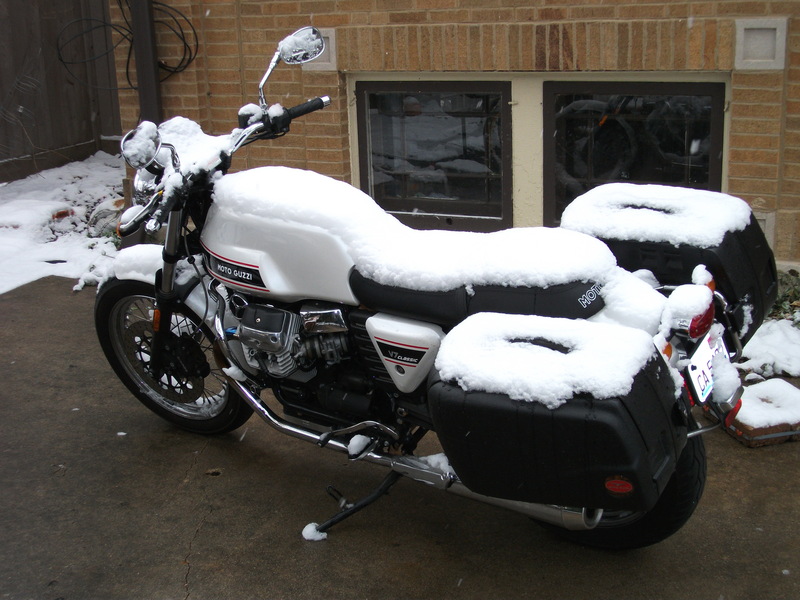 Moto Guzzi V7 Classic – 10,000, ahhh, I mean, 11,000 mile report! Patrick Fitzgerald has become a good friend. I met “everyone calls him Fitz” the same day I met Jim Barron, one cold, cold day in December 2008. I had just moved to town, and decided that hanging out alone was less fun that going to introduce myself to the local Guzzi dealer in Woodstock. Rose Farm Classics was never an easy place to find, and in the dead of winter to a guy that is used to Southern California, everything just looked like tundra. After my arrival, Jim and I shared a few smokes and decided that we “might” like each other. After about an hour of motorcycle talk, Jim gets a call and starts talking to Fitz. After hanging up, he says, “you have to stay long enough to meet this guy. He’s headed down here now. He’s got a lot of Guzzis, including that Falcone in the showroom.” I decided right then that it would take a nuclear event to get me out of there. Jim brewed me another espresso. Fitz’ arrival triggered a gathering at Jim’s desk in his “upstairs office”. I don’t remember the whole conversation, but we talked about bikes and did the usual general conversation that “men of a certain age” do when they have a lot in common and decide that the people that they are talking to are “friend worthy”. So time marches on. It’s well past 18 months now in Chicago for me. I’m living in Detroit and working at GM’s OnStar Division in the Advanced R&D department. I’ve purchased two Guzzis from Jim at Rose Farm, and Fitz and I have ridden together a couple of times, including the maiden voyage of the V7 Classic I now own to the Rockerbox meeting in Milwaukee last year. I now have eclipsed 10,000 miles, which, like the maiden voyage, incorporates a pleasure trip with Fitz. Rockerbox for 2010 was planned the same day as the Wisconsin Moto Guzzi Rally near Mineral Point, roughly 40 miles from Dubuque Iowa in the southwestern part of the state. 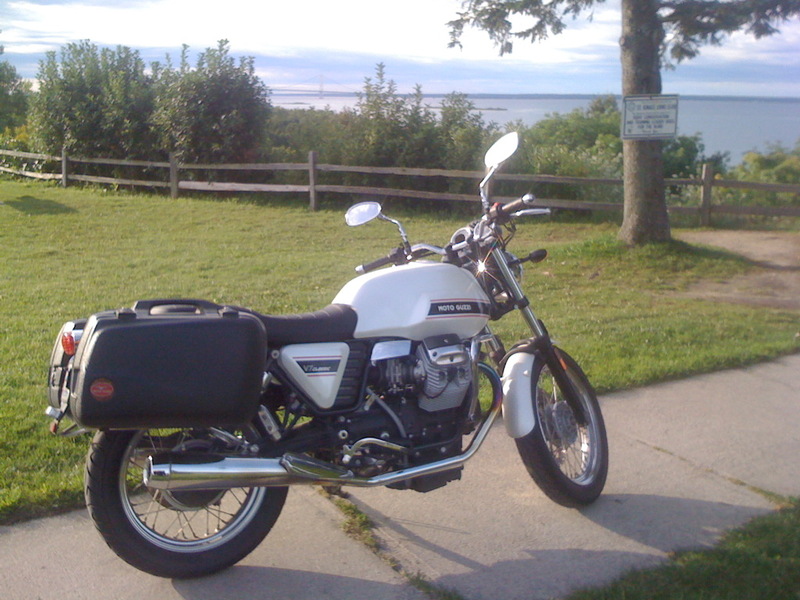 After negotiations with my lovely bride, I decided to leave Detroit late Thursday, and ride up to Mackinac City, with the intent of crossing the Mackinac Bridge and riding down form the UP to the Rally – a total of 731 miles. I left Detroit with roughly 9500 miles on the odometer, and crossed 10,000 miles just north of the Wisconsin border on Saturday in the Upper Peninsula of Michigan. I thought it fitting that I was on new road, riding for nothing but pleasure and cruising at 80mph without a care in the world. 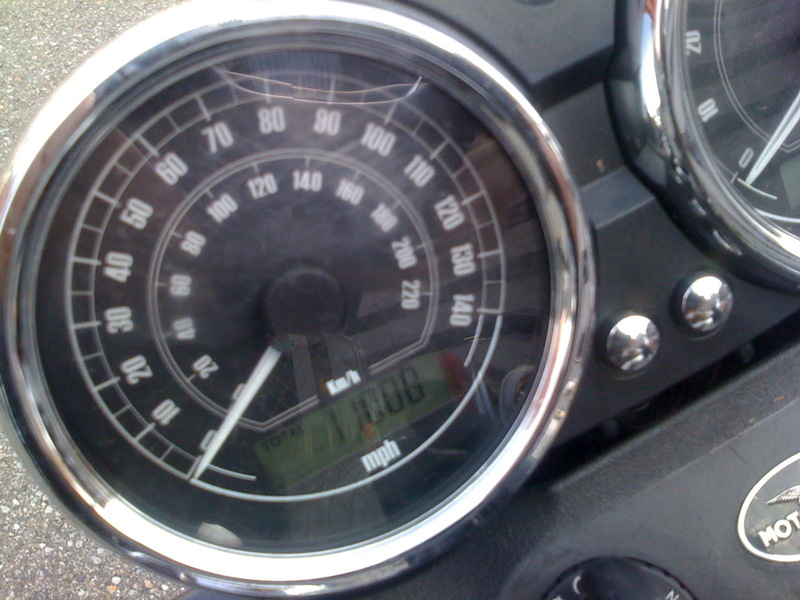 By 10,005 miles I had explored the top speed of the bike on a nice empty straight. I settled back down to my cruise soon after. I arrived at the rally without event. I want to thank everyone that met me when I got there, and those that complimented me on my writing, as I think that telling stories to people is just about the best thing you can do, and if they like them and tell you, it’s just extra cream on the pie for me. Fitz was there. 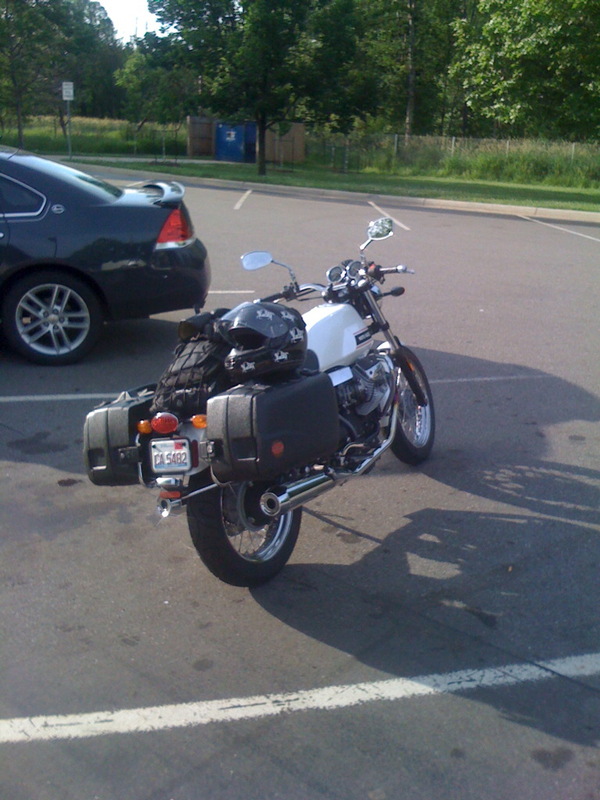 I felt a little extra joy knowing that in this mix of 270 Guzzisti that I truly enjoyed being with, there was one guy that I “knew” as a good friend and connection to the events of my first moving to the Midwest, and the first ride I had on this very machine parked next to me. 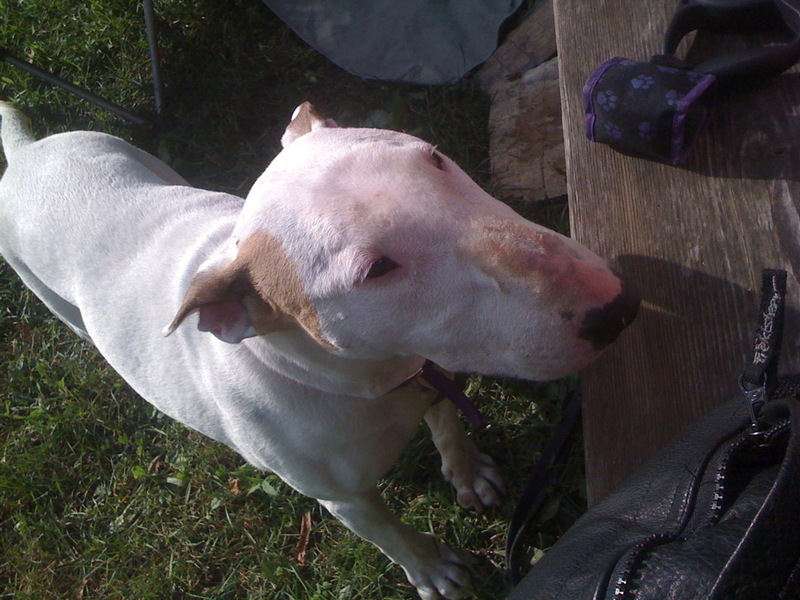 We exchanged greetings, and I met his lovely wife, son and hilarious Bull Terrier, “shooter”. This man is truly blessed with good things in this family, his choice of dog, and the wonderful SPIII that he rides all over the place. I have to admit a little disappointment that he didn’t bring a Falcone or “Big Red” which is a 1000cc V7 Sport “clone” that I have had the pleasure of riding. We spent the evening around a campfire, sharing the great beer served by the Wisconsin Rally organizers and some nice bottles of wine. Fitz said to meet up for breakfast and we’d take a run through the twisties that the hills and dales of Southwestern Wisconsin offer. With more than 270 bikes, almost all Guzzis, this is the MOTHER of all Guzzi Rallies. The Nationals should have so many people! If it were up to me I would call this the National Meet and have a roving venue for those that can’t make it. I hope I never miss another one. The roads, people, food, organizers and attitudes there can’t be beat. I spent the next 24 hours at home uneventfully enjoying my family and preparing to ride back up to Detroit late Sunday. And so I did, also in an unevenful manner. I pulled into my apartment in Grosse Pointe at 11pm, too tired to note the mileage. The nexts morning I parked at work, looking down at my odometer at 11,001 miles. I had just done a 1500 mile loop in 3 days, with nothing to remember but grins and good times. In fact, except for a kick stand spring and one 6000 mile maintenance, the V7 Classic has been the same. Nothing remarkable but grins and good times. It hasn’t used a drop of oil, not one hiccup in the engine, and I’ve only had to replace the tires with Pirelli Sport Demons (HIGHLY RECOMMENDED!!!) and that inner sidestand spring with a stainless steel one after I found fault in the metallurgy (Moose Racing M7712). Other than that, I have enjoyed this Guzzi more than I thought I would, and I had high expectations. From city riding, to long trips on the road and romps through country twisties, the V7 has never let me down or not been up to the task. It’s like a scooter in the city, a Road King on the Highway, and a petite blaster when the pavement turns to ribbons. If “Standard” means “great all ’round bike,” then this is the “true” standard. I couldn’t be happier with my purchase. 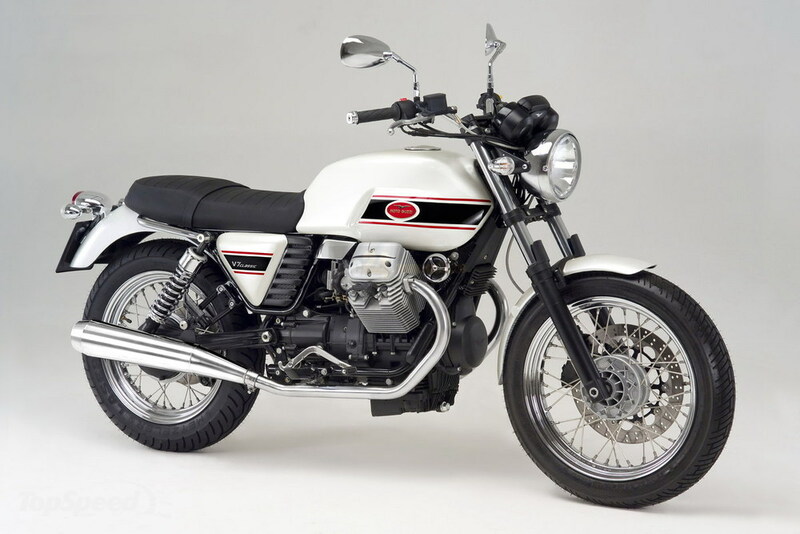 The Moto Guzzi V7 Classic has been a resounding success for this company that is now approaching 90 years of continuous production. It is a comfortable, good-handling and very stylish ride. I’ve found it to be extremely reliable, a great 500-mile per day bike, and perfectly adequate on power. 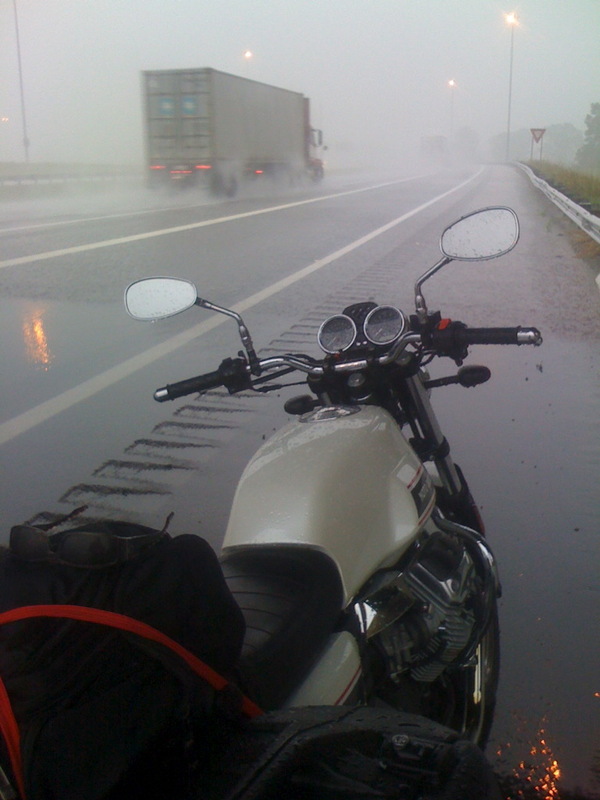 December 2 was the last day I rode. I went out to the patio on December 6th, and, after 3600mi, I think the season is close to over.